About a year and half ago I bought this giant picture frame from Habitat for Humanity and turned it into a headboard. It was only $20 and the exact width of my queen bed! It stayed like that for awhile after I moved but then I got a real headboard and I just slid this DIY version behind my dresser. I figured I'd use it again someday and I'm so glad I hung on to it - because that day has arrived. This was my bedroom just back in February. It seems like so long ago and I barely remember it like this! It's probably because so much as changed in the short 6 months since then! That white dresser is now painted aqua, those curtain panels are gone as is that lamp in the corner and as you may expect, so is that headboard. 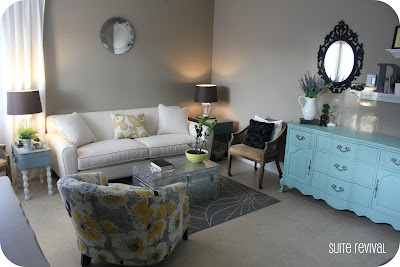 I sold it on Craigslist back when this room temporarily became my living room in the great switcheroo of 2012. And now simply because I get bored way too easily and have a limited about of space to work with...this room is back to being my bedroom! I might have a sickness. 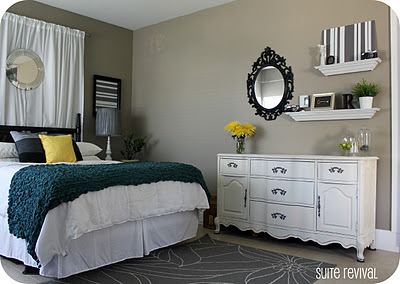 Love the idea of covering a frame for a light weight headboard! On the bed skirt problem, cut it off that annoying fabric that goes under the mattress and apply velcro to the skirt and the box frame...voila, no more sliding and easy to take off and clean! Best idea I've seen on Pinterest yet! How about just buying a fitted sheet to go on the box spring? It's cute, eliminates sliding, and it adds a sleek look to your decor :-) love your ideas.